Johnston's 2451 drumstick has a grip size between a 5A and 5B with a gradual taper to a barrel tip for ride cymbal definition. The gradual taper gives the model a fantastic and quick feel around the kit. 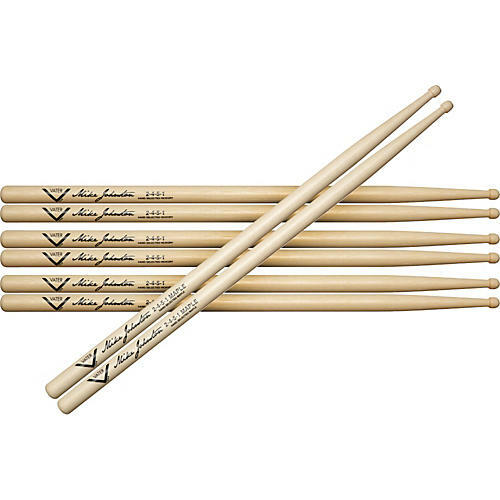 This drumstick pack provides 3 pair of 2451 hickory sticks with one pair of free 2451 maple sticks. The 2451 model is available in both hickory and sugar maple. The sugar maple version is perfect for lower volume and lesson room type settings, while the hickory version is the right choice for live and harder hitting performance settings. "The 2451 is the stick I have dreamed about my whole career. This stick feels amazing in my hand and even better on the kit!"